SiteGround is a top web hosting provider in the world. Their popularity is increasing day by day. There are a lot of reasons for their success. But, the most notable one is that they offer high-quality services to their customers. Thus, they are easily grabbing the attention of the website owners throughout the world. So, if you are one of them, who are searching for information about SiteGround Shared Hosting service, then this is the post for you. We have jotted down this post to share not only our views about SiteGround but also to share some raw and authentic data about SiteGround with you. By the time, you are done reading this post, we hope you will be able to assess whether SiteGround shared hosting is the right choice for you or not. Shared hosting is the most common type of hosting services available. Generally, shared web hosting is the service where multiple users use the same server to host their websites (multiple sites for each user). Typically, shared hosting service is the most cost-effective option for hosting. As there will be a lot of users who will be using the same server simultaneously, the cost of maintaining those servers will be distributed over all of those users. If you are in a tight budget then this is the best option for you. But, if you are a power user who has multiple websites receiving heavy traffic, then you will have to look for other options like the Dedicated, Cloud, Enterprise or even Reseller hosting services. Now, let’s get familiarized with the shared hosting plans of SiteGround. 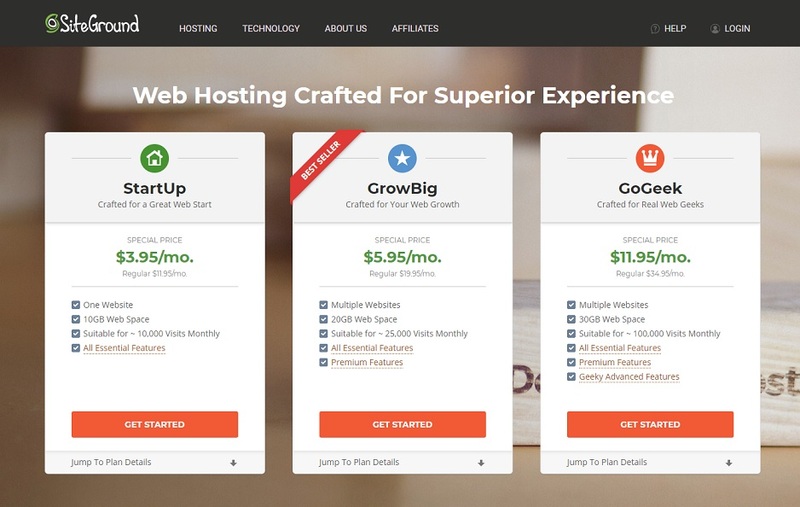 Siteground has 3 different plans on their shared hosting service. They are named as ‘StartUp’, ‘GrowBig’, and ‘GoGeek’ respectively. The ‘StartUp’ plan costs the lowest. The ‘GrowBig’ plan costs more than that. And, lastly, the ‘GoGeek’ plan has the highest price of them all. The price actually depends on the features you are getting with each of these plans. So, you can guess that you will get the best features and services out of the ‘GoGeek’ plan. On the other hand, the ‘StartUp’ plan will come with just the basic features. We will talk about all the features in detail later in this post. The ‘StartUp’ plan has some limited options like you cannot host more than 1 websites using this plan. You will get 10 GB of web space. So, it is suitable for around 10,000 monthly visitors. So, if you receive more than that amount of visitors, you should choose either of the rest of the two plans. The ‘GrowBig’ plan is actually the best seller among the 3 plans. It is because of its versatility. This package sits on the middle of the ‘StartUp’ and ‘GoGeek’ plan. Using this, you will get the best of both worlds. That’s why people actually favor it more than the other two. You can host multiple websites using this plan. And, along with that, you are getting 20 GB web space which is suitable for about 25,000 monthly visitors. However, if you want the best of the best. Plus, you don’t have any budget-related problem then ‘GoGeek’ is the best plan for you. You can host as many websites as you want using this plan. You will get 30 GB web space which is suitable for about 100,000 monthly visitors. On top of all this, you will get the ‘Geeky Advanced Features’. These features are not available on the other two plans and are very advanced ones. So, if you have the budget then this will be the best choice for you. Who should choose the SiteGround Shared Hosting Plan? Shared hosting is the most used web hosting package in the world. Almost everybody starts their web hosting journey with a shared hosting account. Thus, you already know that there are no limitations or restrictions using shared hosting for anyone. Yet, if we are being honest with you then we have to tell you that shared hosting may be the most used hosting service but it is not the most suitable for everyone. So, first, we will let you know who should not use shared hosting. The short answer is, if you have a few huge websites which receive over 100,000 visitors per month then you won’t be happy using a shared hosting account. Your websites will not be able to cope up with the extreme load of traffic. Even though the web hosting companies will tell you that you can host unlimited websites, it is not a good idea to do so. You can host multiple small websites but it’s a straight NO for bigger websites. SiteGround actually has 3 plans on their shared hosting package. Everything depends on your needs. For instance, the ‘StartUp’ plan is suitable for the users who are just starting out. So, if you have a personal blog, or a small business website or even an online shop then you can go with this plan. And if you have a budget issue then this is the best place to start as it costs the lowest. But remember, if you want to host multiple sites at once then this is not for you. Now, if you have multiple websites and receives more than 10,000 visitors per month, then you will love the ‘GrowBig’ plan. You can use it to host a big site or a number of average-size websites. This plan is the sweet spot of all the 3 plans as it is budget-friendly but also comes with all the essential and premium features. Plus, you can host unlimited websites. So, if you have a website or a number of websites which are growing then this is the best option for you. Next, you have the ‘GoGeek’ plan. This is undoubtedly the best one out there. However, it is not suitable for the users who are just starting out. Because it is intended towards the users who have websites which receive around 100,000 visitors monthly. Plus, if you have a typical average sized e-commerce site then this plan will be perfect for you. Also, you will get some additional advanced features (Geeky Advanced Features) with this plan. From the above discussion, it is easy to see that SiteGround did an excellent job creating the shared hosting plans keeping every type of users on their mind. So, whether you are a small blog owner or own multiple heavily-visited websites, you can go with any one of the shared hosting plans of SiteGround. You will find your match for sure. You can use any web applications or CMS (Content Management System) with SiteGround shared hosting service. SiteGround offers numerous custom-made tools for their shared hosting users which are created especially for different types of web applications. Even though you can use any applications, SiteGround actually optimized their service for the popular CMS like WordPress, Joomla, and Drupal etc. You will get all the basic features like 1-click install, AutoInstaller, Autoupdater etc. with every plan. With the Softaculous auto-installer tool, you will be able to install any CMS with just a few clicks. So, you can launch your website in no time. You don’t have to know a lot about web hosting to do that. You will have the ‘SuperCacher’ plugin with all the popular CMSs. This can dramatically increase the speed of your website. There are plenty of services provided by SiteGround on each of their shared hosting plans. We will let you know about some them below. Whereas other hosting providers still use HDD on their servers to store data, SiteGround, on the other hand, uses SSD. SSD is superior to HDD and your website’s load speed can be increased by about 20 times by using SSD over HDD to store the content of your website. And, SiteGround installed SSD on all of their data centers and they don’t charge anything extra for this feature to their customers. When you are using SiteGround’s’ hosting service, you won’t have to worry about the backup and update anymore. Siteground performs over 3 million of auto-updates of web application software on their customers account each year. And, your website’s contents will be automatically backed up too. So, if the data get corrupted or damaged, you will find the backup to restore them with ease. SiteGround has their own security software to take care of the security of their customer’s websites. They are very swift in fixing any vulnerabilities on their servers as well. They have written 800+ WAF (Web Application Firewall) rules to fix numerous vulnerabilities in the last 12 months alone. Siteground is also equipped with their own ‘Anti-Hack System’. So, you can be sure that your website will be in good hands. You might have already know that SiteGround has 4 data centers. They actually allow the users to choose their preferred data center to host their site. You can choose the data center of your choice before creating your account. Then, your website will be hosted on that particular data center. Hosting your website on a data center which is closer to the majority of your website visitors can be very beneficial to your website’s performance. ‘Cloudflare’ is the most popular free CDN available out there. SiteGround integrates ‘Cloudflare’ with each shared hosting accounts for free. You can use any other free or paid CDN services if you want to though. What if you end up not liking SiteGround? No problem. 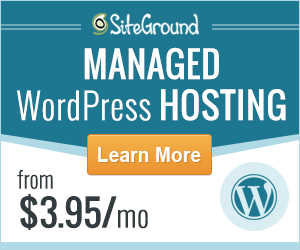 SiteGround has a 30-day money back guarantee. So, if you’re not satisfied with their service, you will be able to get a refund if you reach out to them within 30 days of opening your hosting account with them. There are also some unique and useful features of SiteGround shared hosting plans. SiteGround has divided them into 3 categories which are ‘Essential Features,’ ‘Premium Features,’ and ‘Geeky Advanced Features’. The features you are going to get, totally depends on your chosen plan. For instance, the ‘StartUp’ plan only includes the ‘Essential Features’. Then the ‘GrowBig’ plan comes with both of the ‘Essential and Premium Features’. Lastly, the ‘GoGeek’ plan has got all of the features included. For your convenience, we will explore all the 3 categories one by one below. It doesn’t matter which one of the shared hosting plans you use, all the ‘Essential Features’ are included with all the 3 plans. You will get some of the basic and most useful features packed in the ‘Essential Features’ category. Let’s know about some of them. First off, you will get free website builder, free cPanel and SSH Access. You can create unlimited custom Email accounts (e.g. email@yourdomain.com), FTP accounts and Databases on your website. Along with these, you are getting free daily backups (only backup no restore). And, most importantly, SiteGround will provide free SSL certificate too. Without using an SSL certificate your website will be seen as an insecure site. Thus, visitors will not put their trust on your site. Normally, you will have to buy SSL certificates, SiteGround is giving them for free. Siteground has developed an advanced technology called ‘Unique Account Isolation’. It keeps every web hosting account isolated from each other on their shared servers. So, if anyone of those web hosting accounts gets attacked by hackers or crawlers, all the other accounts from that specific server won’t be affected by that. SiteGround has teamed up with ‘SpamExperts’ to keep their users free from spammers. SiteGround offers this email-security service for free of cost along with all other essential features. All of the servers of SiteGround are under constant monitoring. SiteGround uses the well-known automatic server monitoring system ‘Guardian by 1H’. This system is super-fast on solving any type of overload and outage problems. In fact, it can solve the problem in less than a second after they have taken place. All of these are just the tip of it. There’s more on the list. So far we have talked about the basic features which come with the shared hosting plans. Now, we will talk about the Premium Features. Unfortunately, you won’t get this features on the ‘StartUp’ plan. It comes with the ‘GrowBig’ and the ‘GoGeek’ plans only. This category includes free backup and restore. Your websites will be backed up automatically for up to 30-days back. And, you can also restore them whenever you need to. If you are not a techy person and already have a website but want to change your web hosting provider to SiteGround. Then you might face difficulty migrating your site. That’s why SiteGround offers free migration as a premium feature. Siteground team will take care of the entire migration process. Your website won’t go down for a second in the meantime. Indeed, it is a very useful feature. However, if you are a ‘StartUp’ plan user then you need to pay for the migration process. When you get the ‘GoGeek’ shared hosting plan, you will be able to enjoy the ‘Geeky Advanced Features’. This category includes all of the essential and premium features and some other additional advanced features. The first benefit of this category is that your website will be hosted on a server with fewer accounts. So your website will perform better as the server will not have to cope up with the high-traffic load. 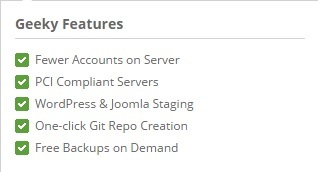 You will also get WordPress and Joomla staging. This is a very important feature. Using this, you can create a clone of your live site in a staging environment and can customize it. It won’t mess up your live site. When you are done designing/customizing your clone site, you can push that to live with just a single click. And, a backup of your live site will be created automatically and instantly. So, if anything goes wrong, you can return to the previous state with just another click. This is a life-saver if you love to tweak your sites from time to time. Another awesome ‘Geeky Advanced Feature’ is that GIT comes pre-installed on your servers. GIT can be used to create repositories of your websites. Then you can access, download, and customize the entire site even offline. Later, you can again upload the customized site with just a few clicks. Additionally, SiteGround offers an SG-GIT interface which can be used to create repositories of the popular CMSs like WordPress, Drupal, Joomla, PrestaShop, and Magento. You will have a visual interface to create the repositories, so even if you are a non-techy you can go ahead and create one yourself without any hassle. If you own an e-commerce website then you will love this next feature. SiteGround provides PCI compliant servers as a ‘Geeky Advanced Feature’, which will help your e-commerce website to meet all the safety regulations. You can also take manual backups of your site whenever you want to. Now, we will test out SiteGround’s real performance. We will be using the Pingdom website speed test. We will be using this website as the test subject. Because ReviewPlan.com is hosted on SiteGround. Yes. You heard it right. We have been using SiteGround for a long time. Let’s run the test. This test is conducted using one of the test servers of Pingdom which is located in San Jose, California. From this, we see that our website loaded completely in just 829 ms. And, that is faster than 92% of the websites tested on Pingdom. Incredible! In this case, we have used the Stockholm test server of Pingdom. However, our website has performed far better on this occasion. The previous test result was not bad either. But, this time our website loaded in just 685 ms. That implies that our website was faster than 94% of tested websites on Pingdom. Both of these tests prove that SiteGround has some of the best quality servers. And, for that reason, our website is hosted on a SiteGround server performed so well on the Pingdom speed test. We are pretty happy with the results. The industry-standard uptime record should be 99%+. So logically, you should choose a website hosting provider which can manage to attain this record consistently. Even SiteGround isn’t an exception in this case. Hopefully, you already know that we use SiteGround to host this site. And, we have been keeping an eye on the uptime performance of our website for a long time. We regularly monitor the uptime and the downtime of this site. So, we will share the data with you now. As a result, you will be able to see the true uptime record of SiteGround. The uptime stat of ReviewPlan.com. Here, we are seeing the uptime stat of our website of the last 10 months. 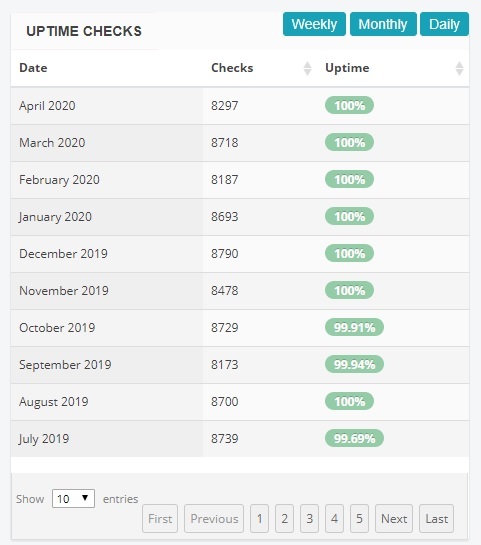 Amazingly, SiteGround has managed to keep 100% uptime record for the majority of the months. And, the uptime record was not less than 99% on any months. So, we see that SiteGround actually could keep the industry-standard uptime always with ease. That is awesome. As we use SiteGround as our hosting provider we need to get in touch with them from time to time. From our personal experience, we would have to tell you that SiteGround has a top-notch customer support team. They have always helped us. Anytime we have contacted them, we were answered instantly. And, the professional customer representatives were with us till the problem was solved. SiteGround offers 24/7 customer support. So, you can connect with them any time you want. The ‘GrowBig’ and ‘GoGeek’ plan users will receive premium support. That means those users will be given the highest priority. You can use one of the 3 methods mentioned below to contact them. Depending on your emergency you can choose the best method for you. They have their offices in 4 cities (Sofia, London, Alexandria (USA), and Madrid). You can also directly show up there if you’re from those areas. Our Final Thoughts: Should you use SiteGround Shared Web Hosting? From our own firsthand experience, we can confirm that SiteGround is truly the perfect web hosting provider. We are more than content with their service. Even the popular CMSs like Drupal, Joomla and WordPress officially recommend SiteGround to their users. And, it is also clear that SiteGround shared hosting plans were crafted keeping every type of users’ needs in mind. The hosting plans come with a lot of features, yet they are very much budget-friendly at the same time. That’s why everybody will be able to find a package which will perfectly suit them. Siteground shared hosting service has everything from faster servers, high uptime, rock-solid security to premium support. So, if you are searching to get a shared hosting package then there’s no denying that SiteGround shared hosting is the best option for you out there.